The first thing I noticed when I entered the Lyric Opera House for Anna Netrebko’s recital “Day and Night” was the amount of Russian being spoken in the lobby—Anna’s fans from Chicago’s Russian community were out in force, and in all the audience there was a frisson of expectation for the day’s event. Entering the house, we were greeted by a piano, chandelier, and gossamer drops lit in the orange of sunrise. And from the diva’s entrance with her pianist Malcolm Martineau, carrying a bouquet of blue flowers, we knew we were in for a remarkable afternoon. And, indeed, we were. Netrebko was in absolutely splendid voice, both for her gleaming high notes and the rich, robust sounds of her middle and lower registers. She sang throughout with a palpable sense of joy and ease in vocal production, never a hint of strain or any moment forced. And unlike many recitals I’ve seen, she managed to make every song its own unique little scene, entirely different and entirely personal. Every selection showed sensitivity to text, generosity of emotion, and a physical grace that was always expressive. This was a mature artist at the top of her game, and she made nary a misstep all afternoon. It was a spectacular, moving, riveting, and thrilling performance. The programs’ first half delivered mostly joyous songs celebrating nature and the pleasures of love, starting with three songs by Rachmaninoff, “Siren” (Lilacs); “U moego okna” (Before my Window), and “Zdes’ horosho” (How lovely it is here), sung with delicacy and pure tonal beauty, utilizing her bouquet to lovely effect. 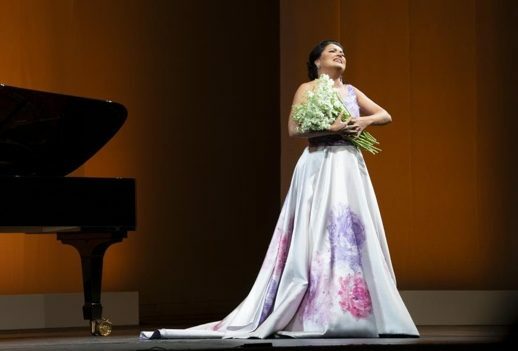 Ms. Netrebko was dressed in a gorgeous off-white gown decorated with lilac and red accents, and she knew how to work it, moving with almost supernatural grace. She put her flowers down (we were going to see them again later), for Rimsky-Korsakov’s “Zvonche zhavoronka pen’ e” (The lark sings louder), flowed by an exquisite rendition of Richard Strauss’ “Morgen”, when she welcomed violinist Robert Hanford who played with aching beauty. We continued with selections from Debussy, Tchaikovsky, and Frank Bridge (his song “Go not happy day” a bit too cutesy). But the best moments of the first act were Netrebko’s remarkably deep interpretation of “Depuis le jour” from Charpentier’s Louise, sung with a vast variety of vocal colors, and her last song, Leoncavallo’s familiar “Mattinata,” sung with seductive charm and vivacity. At the very end of the song, Ms. Netrebko grabbed the flowers from the stage floor, and, on the final note, flung them to the left and right, arms outstretched. OK, it was definitely a diva moment, but it worked. It is the rare performance when you can’t find anything to complain about but the clothes, but Ms. Netrebko’s second act entrance, accompanied by the fine mezzo Jennifer Johnson Cano in a pale blue “no gay friends” gown, was a bit of a shocker. Enough said, as the glorious singing continued with Netrebko and Cano’s voices blending beautifully for the Duet of Lisa and Polina from Tchaikovsky’s Pikovaya Dama. Darker-themed selections followed with songs of Tchaikovsky, three by Strauss, Faure, and Dvorak culminating in a ravishing and touching “Son” (The Dream) by Rachmaninoff. Garnering the largest ovation of the evening was Netrebko’s playful, passionate and joyous singing of Douglas Moore’s “Gold is a fine thing” from The Ballad of Baby Doe and the return of Ms. Cano for the Barcarolle from Les contes d’Hoffmann, smoky with sensuality. Malcolm Martineau’s contribution to the success of this recital was vastly important. He played the music of these different styles and moods with precision, nuance, and sheer beauty. It was as if he was living in the music, deeply concentrating while playing and breaking into a huge welcoming smile after the final note had faded away. He and Netrebko stayed on the same wavelength all afternoon. We had two encores after the huge ovations at the end: Luigi Arditi’s “Il Bacio” and Richard Strauss’ “Cäcilie”, both splendid, though I admit I was hoping for an aria from one of the Verdi roles that Ms. Netrebko is currently singing or preparing. But it was a pleasure and a privilege to be in the presence of these great artists for a few hours on a Sunday afternoon. I haven’t left an opera house this happy since the Price/Horne/Levine concert at the Met some 35 years ago.